For those who always want the latest update ie android x86 here the android 4.3 jellybean x86 has been released and can be used after the previous android 4.2.2 x86 jellybean have to posted a few months ago and although android 4.4 kitkat released but android x86 no news yet about it. With ​​there are some changes that have been updated and most of this time has been updated too with the support arm translator, which means we can run almost all android apps in google play store, different with android previous ones is android x86 jellybean 4.2 that not support. Before we try to install directly to the hard drive perhaps we could try to install android x86 in virtualbox so that we will know what the pros and cons of this android jellybean 4.3 x86. And if it is as expected and works well as the android phones are used. That way we can evaluate for themselves of the advantages and disadvantages of android x86 that we will install, because maybe there will be people who want to dual boot between android and windows that are installed together on PC/Laptop. - Upgrade Mesa OpenGL ES library to 9.2 devel for support amd radeon acceleration and intel chipset. There are several ways to install android version of this computer or android x86 jellybean 4.3, and I give it two ways. dual boot android and windows. note: change the red text with partition installed on android from your computer example if android on partition or drive D: then replace with (hd0,2) sometimes Drive D: = (hd0,3). Also this steps can be use on Linux ubuntu virtualbox. Download virtualbox windows version if it will install a virtual box in windows here because there are several other options such as Linux and MAC OS X. After downloading the next step is to install virtual box on computer and start preparations to install android in virtual box. Virtualbox installation on ubuntu linux or in windows like windows xp, windows 7 and windows 8 are method. 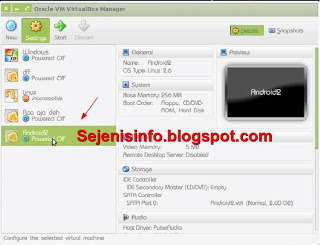 Open Virtual box already installed on your PC or laptop and then click the new button to create a new virtual Android x86. This images from my second blog. Then a new window will be seen and click next, fill the name in accordance with your current in the box provided, switch to the Linux operating system and switch to linux 2.6 version can be seen for example in the image below and click next. The new window will be see to set memory capacity that will be used in a virtual box for android x86, if your computer has 1GB of RAM or memory then use the virtual box in 256mb or 512mb. 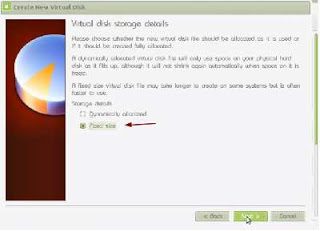 Click next for another setting for the virtual hard disk, Create new hard disk and select the VDI and then select Fixed size and click next. Click next to set capacity to use, I use only 2GB. Click next and click create and wait until bar process is to create a virtual hard disk finish as in the example picture below. Next click on the settings button to the storage arrangements to enter iso file into a virtual box that you created. Because the steps are still long and I was a bit sleepy to continue this post, more can be seen on the video below for how to install android 4.3 x86 jellybean on virtualbox. are you using The latest release virtualbox is version 4.2.18. ? What android x86 iso ? Create disk with "Dynamically allocated" and format to ext32 setting Operating system "Linux" and version "linux 2.3"
I've got Android x86 running on Virtual Box except for OpenGL 2.0. Do you know how to get that as well? gan bisa di root pa di kasih aplikasi RootEx ga?